November 23, 2015 November 23, 2015 / Elizabeth T.
Brrrrr! Is it just me or is it chilly outside? I can’t believe it’s already the middle of November, and it’s finally getting cooler in Los Angeles! Though I love the chillier weather (hello sweaters, scarves, and boots! ), my skin is getting a bit dry from all of the cool air and dry winds. To combat the harsher weather conditions, I’ve taken my usual skincare routine up a notch (or three) and added a few moisture-intense products to help my skin stay hydrated and healthy during these chillier months. As many of you probably already know from my previous skincare routine post, I swear by Ole Henriksen’s Truth Serum Vitamin C Collagen Booster. 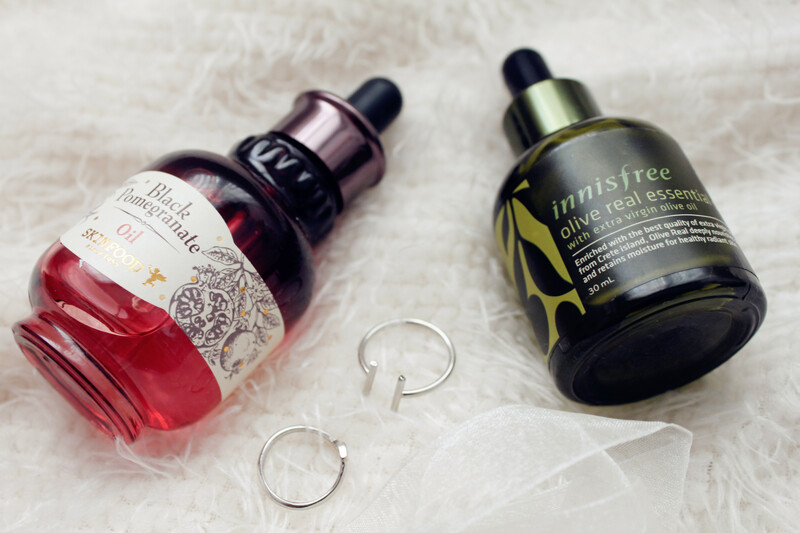 During the cooler months, this serum is still a staple in my skincare routine, though I also add in the Innisfree Green Tea Seed Serum into my regime as well to give my skin ample moisture and elasticity. I typically use the Green Tea Seed Serum during the day, whilst I reserve the Vitamin C Collagen Booster for the night time. Because Vitamin C contains more whitening-based properties, it likewise doesn’t provide as much moisture as I would need during the fall and winter, therefore making me more susceptible to dry skin and flaky patches. 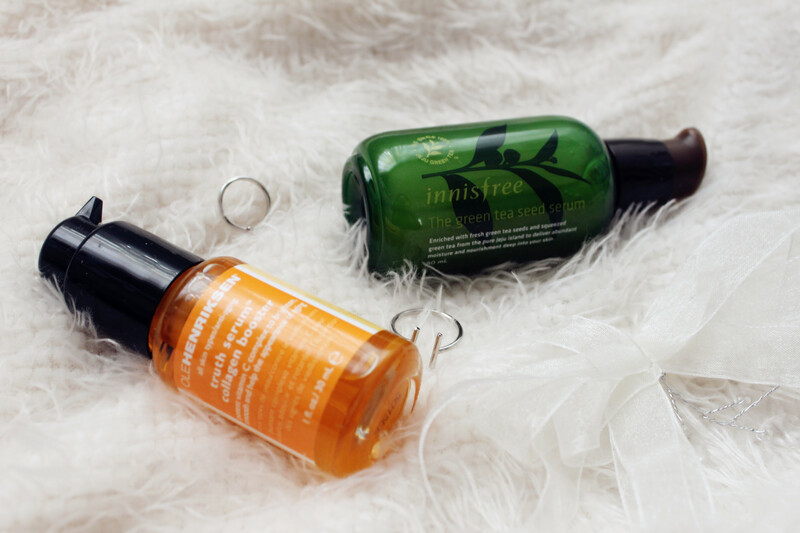 By balancing my Vitamin C Serum with a more moisturizing product like the Innisfree Green Tea one, I allow my skin to get the best of both worlds. Aside from my normal skincare routine, I’ve also been regularly doing sheet masks as well. While I would typically do masks about once a week during the summer, I now do them every other day or every two days because my skin can really use the extra boost of moisture. Though they feel a little cool on the skin when you first apply them, I love how bright, supple, and glowing my skin looks after I finish! 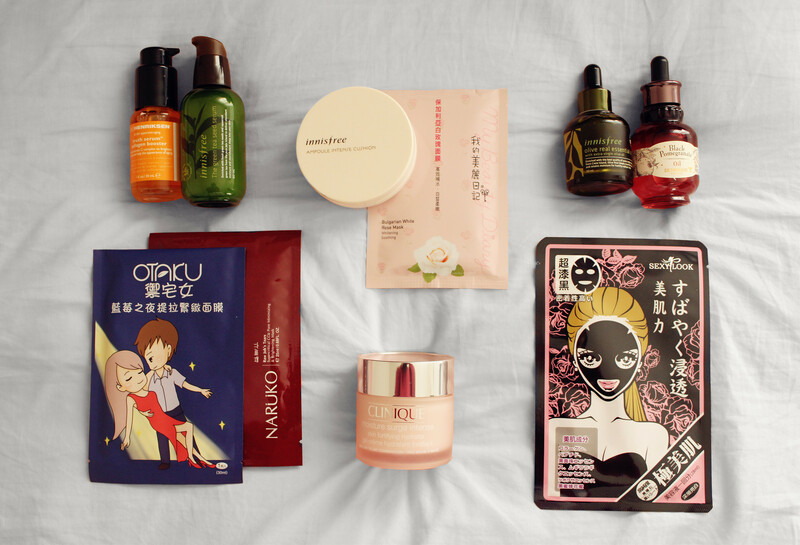 I have a lot of different varieties of masks at home, some from popular Asian brands such as My Beauty Diary, Nature Republic, and the Face Shop, but I also want to try some of these from Too Cool For School, SK-II, and Sulhwasoo. And last but definitely not least, I’ve even upped my makeup game by occasionally using cushion foundations as well! 😀 Haha I know, extreme right? But my skin definitely needs it! Cushion foundations are generally more moisturizing than regular foundations, and with all of the holiday parties and social gatherings that are happening soon, I know my skin will definitely be thankful for some added moisture. My current favorite is the Innisfree Ampoule Intense Cushion, but after I’m finished with this one, I think I’d like to give the Amore Pacific Color Control Cushion a try as well. What are you all using for the cooler days? Is your skin also becoming more dry? Let me know in the comments below? Skincare is so important, especially around the winter months. That vitamin C booster is the best. Yes, skincare is essential during the winter months 🙂 Haha the Vitamin C booster is one of my faves too! ❤ Thank you for stopping by Rachel! Great essentials! Love this post! Thank you so much Trang 🙂 Glad you enjoyed the post! Great tips… great review, thanks for sharing…. My skin becomes dry and flaky around this time of the year too, so I know what you mean, Kay! The Clinique cream is definitely worth a try – it’s done wonders for my parched skin 🙂 Thank you so much for visiting, and I’m glad you found this post helpful! Perfect picks! I definitely need to pick up more face masks. Those are my favorite and a great skin pick-me-up! It was so interesting to read about! Can’t wait to see the new one! I’m always curious to learn more about oils and their benefits, so it was nice to read your blog post for insights and suggestions. I also love that you use Vitamin C and Green Tea, I find both to be so helpful and beneficial for my skin! I’ve been hesitant of oils in the past as well, since I thought they’d clog pores, but after trying them, I don’t think I can live without them 🙂 The Vitamin C and Green Tea serums are really great for the skin too ❤ Very refreshing! Thank you so much for stopping by love! I’ll have to try some of these items! Getting your skin hydrated is probably the most important thing in winter. London is so cold and dry for the moment. I’ve been putting mask on practically every night! and i love the Clinique Moisture Surge Intense Skin Fortifying Hydrator, its one of my favourite moisturising products so far! and not to mention that it is in pretty pink haha! I’m such a sucker of beautiful packaged products! great choice Elizabeth, thanks for sharing! I can’t agree more, Tiffany. The winter months make skin so dry, it feels irritated and parched 😦 Haha I’ve been using masks almost every other night too, and it’s been really helping 🙂 And yes, the Clinique is one of my faves too (and the pink color is just too gorgeous) ❤ Thank you for stopping by Tiffany, and stay warm in London! Great post! I needed this! such a nice selection of products! Totally adore those masks!! Love your skincare picks! Nice post! Love it that you pay attention to this, it’s so important and people forget about this all the time! Amazing post and products. Despite what most people think, hydration is more important during winter than summer! My favourite moisturiser is the Body Shop wild argan oil body butter which keeps my skin hydrated and soft while it smells like heaven 🙂 I am sure you would love it! Have a great weekend dear. 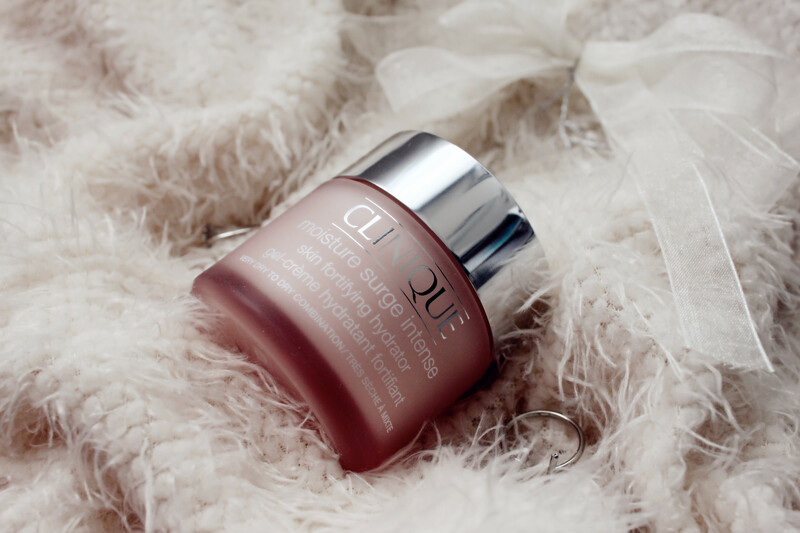 Aww I know, the cooler weather is really zapping up all of the moisture from my skin 🙂 The Clinique moisturizer is one of my favorites ❤ Thank you so much for stopping by Nadia, and stay warm too! Haha aww I know Tiffany 😦 My skin tends to be a bit dry too, so I’ve been using so much moisturizer lately. The Clinique one is very good 🙂 You should definitely give it a try!